If my calculations are correct it should be Super Adventures' 6th birthday right about... now. I've been watching it creep up on me for a while, struggling to come up with an idea of what to do about it when it got here. One idea I had was that I could turn the site around and start going back the way I came, revisiting all the games I've played, starting with Carmageddon, then Spy Fox, and so on all the way back to Deathbringer. Then I had a slightly less terrible idea: I could work through a huge chunk of my game requests all at once! 50 games in one article, each getting a screenshot and a couple of lines of text. It'll be just like the olden days when I'd put up a few dozen half-assed posts a day because I didn't know what the hell I was doing. But in the end I realised that if I want to go back to Super Adventures' origins what I really need to do is find an old obscure Amiga game I haven't heard of and go into it blind. 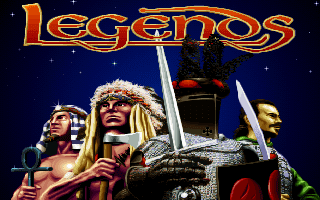 So this week on Super Adventures I'm playing Legends! I know about all kinds of games, Amiga games especially; it's a side effect to suffering prolonged exposure to a shelf full of game magazines as a child. But I have never heard of this one in my life and that's kind of weird, because it's by Krysalis, the folks who created Soccer Kid and Arabian Nights. I've got a theory about why it slipped under my radar though, and that's because my Amiga magazines only go up to 1995. By the time this came out everyone was moving away to SVGA PCs and next gen consoles and I doubt even the DOS port of this low-res Amiga game got much attention. So they left it a bit late there. But then I suppose a game like this takes a while to make... possibly. Depends on what kind of game it is really. The title screen up there makes me think it's some kind of strategy game with empires clashing across the world, or an RPG with classes from across history, but that doesn't narrow it down much and it's just as likely to be another platformer. 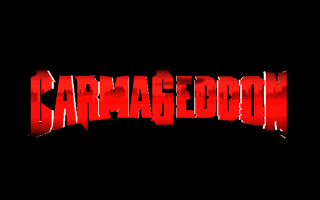 All I know for sure is that it's not that classic isometric RPG; that's Legend without the S.
This week on Super Adventures you can look forward to several words on the subject of PlayStation-era vehicular carnage racing game Carmageddon! Or is that supposed to be CarmaGeddoN? The oversized letters are throwing me off. It feels like it's been ages since I've had a racing game on the site. In fact looking back through the archives it seems like the last one was Super Mario Kart all the way back in 2013. I don't remember much about this besides what I can pull from my fuzzy memories of old magazines, but I expect it to be dissimilar. I'm also expecting to be driving a red car with spikes running down the middle. Plus I'm sure this is the one with a picture of a bloke in the top left of the screen that makes faces when you run people over. Or run zombies over if you're playing the censored version with the green blood, which I'm hopefully not. I've had enough zombies lately thanks, no more zombies. I'll be playing the Carmageddon Max Pack from GOG, all packaged up to run on modern PCs with nGlide pretending I've got a 3dfx card. So the graphics may potentially be a little prettier than they were back in the day, but I wouldn't bother clicking the screenshots for a better view because they'll all be 640x480 resolution or less. This week on Super Adventures, I'm taking a look at a Junior Adventure about a fox who does intelligence work, designed for 5-10 year olds! Because it appeared as a gift in my Steam library one day, and I want to know if I should be grateful. 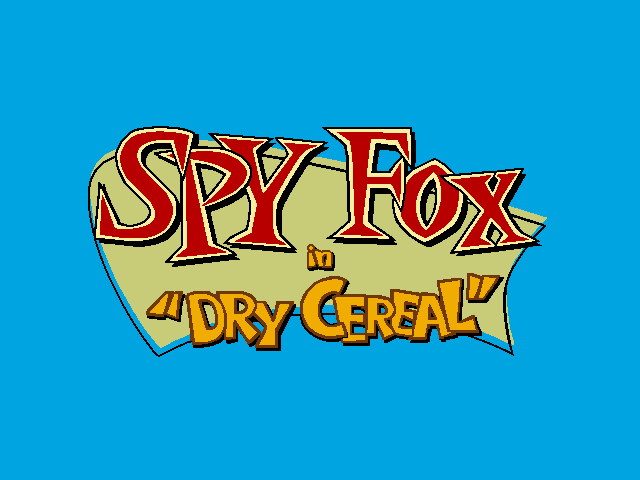 Spy Fox in "Dry Cereal" is apparently the first of three Spy Fox adventure games, and I've never played any of them at any age, so I have zero nostalgia for the series. I've managed to go my entire life so far in blissful ignorance of what any of Humongous Entertainment's games are like, but I am very slightly optimistic because I know that it's where Monkey Island creator Ron Gilbert disappeared to for a while after Monkey Island 2. The Steam download comes with ScummVM so that it runs on modern systems, but I don't know if they've given me the US or the UK version. I've read that there's a few small differences between the versions, the main one being that the game was redubbed with British accents! Spy Fox sounds like a suave English agent in the UK dub, but in the original game he's more like Don Adams from Get Smart. I've no idea why they did this, half the cartoons on British TV come from America and we'd been listening to Don Adams' voice come out of Inspector Gadget's mouth for years, but I guess they were concerned some references would fly over young kids' heads. They'd have never heard of Get Smart for one thing. This week on Super Adventures I'm looking at this title screen wondering what 'Custom' does. Is that the 'Options' option maybe? Now I'm wondering if that other Tales game I played a while back did this as well; is it a Tales tradition, or are they rebelling against standard video game terminology for the sake of being weird? I've only really played one of these games before, Tales of Destiny II on the PlayStation, so I went back and checked and it turns out that it has 'Customize' in place of 'options', so I see what they've done here. It also turns out that I played that six years ago now, so that explains why I've forgotten everything about how Tales games play. 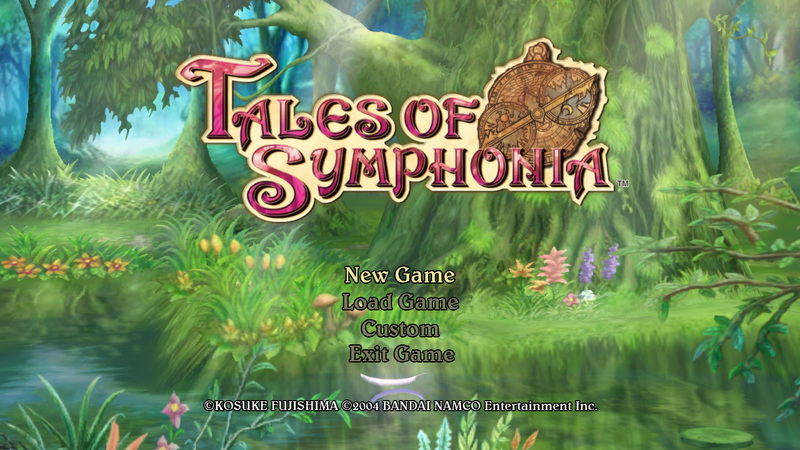 All I remember is that the trees looked very nice and by the look of this title screen that definitely is a Tales tradition. Here's a fact that'll shock absolutely no one: Tales of Symphonia here is the 5th game in the long running Tales series, and yet it's the first to have been released in Europe! I'm surprised to learn that they've already reached game number 16 since then though. It's kind of hard to keep track of where they're up to as they don't usually put numbers on the games, and when they do you can't trust 'em. If you're curious, Tales of Destiny II is the 3rd game... and Tales of Destiny 2 is the 4th. One thing I like about consoles like the Super Nintendo and Mega Drive, is that they had seemingly infinite games released for them during the 90s. Sure its actually closer to a few thousand, but when you only play 50 something games a year, that may as well be infinite. Every time I think that I must be running out of interesting games to play, there's always something else in the library to check out. Which is why I'll never be tempted to do a Chrontendo-style project of my own for the SNES, as that'd be one hell of a mountain to dig through. 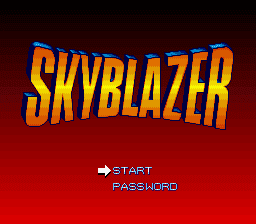 Anyway, today's semi-buried SNES gem on Super Adventures is Star... Skyblazer. I keep wanting to call it 'Starblazer' and have to correct myself, because this isn't a black & white sci-fi anthology comic or the US adaptation of 'Space Battleship Yamato', it's the Western version of a Japanese game called Karuraou. I'm not sure what that means exactly, but a quick Google search tells me that Karura is an alternate Japanese spelling for 'Garuda', a Hindi god with the head and wings of an eagle. Garuda's also what the game's hero was called in Japan, until it was changed to 'Sky' for the Western release.